The new Twitter Camera Apk is here. With this new feature, the official Twitter app is now adding more fun to your camera tab and uploaded images. The new Camera Screen is enabled for some devices and soft launch is only available in a few regions. But as usual, we are here with the Twitter Camera Apk updated version of Twitter app client for you. Although there is no official twitter update available on the Google Play Store which has this Twitter camera feature updated. But we are here with this Twitter 7.86.0-release.37.apk which enables the new camera feature in your Twitter app. The main attraction in this update is the new camera screen. Just like Snapchat, swiping to the left now opens a camera view. Tapping the shutter takes a photo, and holding it down captures a video. You can also select the ‘Live’ mode to start a Periscope live-stream. Also Download: Twitter Lite Apk for Android devices 2019. Here are some of the main features of the Twitter Camera Apk app. Faster and better Photo taking features enabled. New Photos have bolder and better-looking captions. Snapchat like instant video upload is now possible. All you have to do is follow this step by step guide given below. 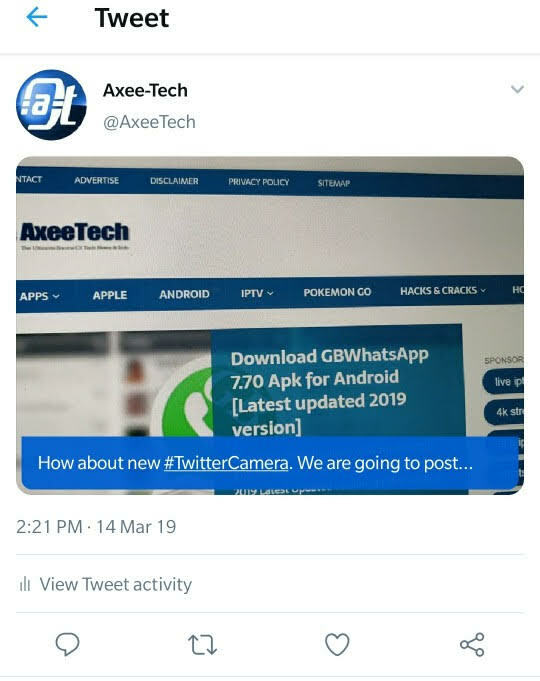 1- First of all Download Twitter Camera Apk file the latest version from the given link below. 2- Now make sure to enable the Unknown Source File installation in your Android device settings. 3- Once done, tap on the downloaded Twitter Apk App. 4- In the next step tap on the Install Button. 5- Wait for the Installation process to complete. 6- Once done simply tap on the Open button and the Twitter App will start for the first time. Here is how an image uploaded using the new Twitter Camera apk updated app looks like. Here are some of the screenshots of Twitter Camera Apk twitter App update for Android.